My two signature MIxed Media Courses COMBINED: Mixed Media Magic & Mixing the Media - 100% of the tools and techniques to make YOU a Mixed Media MASTER. Watch Karen's Video to Learn More! Yes! I want to become a Master at Mixed Media! Mixed Media is my passion, above all else. My mission, is to infuse YOU with the same passion as I hold for this mad fun within my soul. The best (and most effective) way for me to do this is to teach you absolutely everything I know about this thrilling art form (and that is a whole heck of a lot I'll have you know!!) while making it as supremely FUN as humanly possible!!! This bundle is LITERALLY everything I know. For you. Packaged up nice and neat and ready to set your creative soul on FIRE! This course that you're about to buy is actually 2 completely separate courses all rolled into one. It is my Mixing the Media beginners course mashed perfectly together with my more advanced course, Mixed Media Magic, which takes it's name from my book (of the same name, Mixed Media Magic). My Mixing the Media course is the absolute perfect course for beginners. It was specifically tailored for creative people who have had a little fun dabbling with acrylics at some point in their lives but wanted MORE. MORE materials, MORE supplies, MORE FUN. And this course launches them in the perfectly right direction with all of it! But it's hard to have fun when you're not sure what to do or where to begin because you've never combined so many ingredients before (and so you're too busy stressing out over the mess you're about to make!). After the fun begins, we ease into play and learning. Learning about the tools and supplies to get us up and running as quickly as possible is the most practical way to get started and then sooooo very quickly after that we make begin making projects! Art Journaling projects (including how to make your own from altered books and cereal boxes) to working on upcycled record jackets using maps and scraps to full fledge faces, I take you to oooooh so many creative places! Check out some of the many projects you'll learn! This is a cityscape of the Chicago skyline using maps of Chicago on a vintage double lp! I'll teach you how to make your favorite city's skyline using the exact same, easy approach! Ever thought to add drawers to your art journals? Well why not! Follow me! I'll show you how to add whimsy and fun to your ordinary sketch books! Then I walk you step by step through my easy method for creating Mixed Media faces. We will blend skintones to perfection using juicy markers! Aren't you happy to know that there is no paint required to add depth, dimension and drama to your Mixed Media Girls?!? My method is easy, fun, and forgiving (and you can erase if you make a mistake to boot!!!). My beginners course culminates in one of my most popular lessons, Washi Tape Girl!! The technique is sooooo easy and fun, once you learn how! I cannot WAIT to show you how! I've seen many variations of her over the years from past students and the results are FABULOUS and FUN! There are actually many more projects that we do in the Mixing the Media course but I'm afraid we don't have all day (sooo much more to show you, gah!) but suffice it to say I launch you into a complete world of goodness that will leave you wanting to create more and more! And luckily, I HAVE SO MUCH MORE IN STORE! Once you've mastered those methods you can segue smoothly and easily into the projects that await you in my Mixed Media Magic course! The projects vary from easy to difficult (but now that you're a seasoned expert you can jump into literally any one of them and be totally good to go!). Just because I said "easy" doesn't mean I meant "boring" either! These projects are tried and true and adorable and hang in people's living rooms for goodness sakes! As I'm the ever learning and exploring, I also am DELIGHTED to segue you into the exciting world of Encaustics! Just for a bit, just for a taste! For those of you who've been curious to try! It's so not as hard as you'd think, I hope you'll give this one a go! And of course I can't let you go without practicing your darling drawn faces! Isn't it crazy what you can do with just a simple Tombow marker and some water? OH! You haven't tried this simple technique yet?? WOMAN! You better get on in this class!!! If you own a book version of Mixed Media than you know very well the Dragonfly Triptych that is featured in it. You can learn, step-by-step, how to make the backgrounds and the girl. Luckily for you, in the course, you can the real time lessons for the Girl, Dog AND CAT! I know, I know, it's kinda ridiculous...the number of projects we are going to do together (for a stupidly small sum of money now that I think about it!...Do you know that where I live, in Raleigh, North Carolina, that a full day workshop at Jerry's Artarama is $120...and that doesn't include supplies. I am just thinking about how many days it would be to teach all of these projects to you!!! LIke 2 weeks!!! And you get ALLLLLLLLL of them for only a little more than that? I mean, WHAT?). Don't worry!! This is taught in 100% real time. Just ME and YOU and our music and our musings. Step by step, the whoooole way through! You won't believe what you can do! And the last one is for my art journal fans (because, art journaling...do I even have to say more??). From learning to transfer, to blending paintings into photographs, drawing fingers and faces and doodling around, this project has it all! I invite you to join the other 4,500 students from around the world participate in this awesome artistic journey. To truly understand the supplies you can use to make outstanding artwork. How they work, why, where and when to use them in to make successful pieces. How to select the perfect used book to alter in order to create an art journal that will be treasured forever. How to transform ANY surface into one suitable for painting. 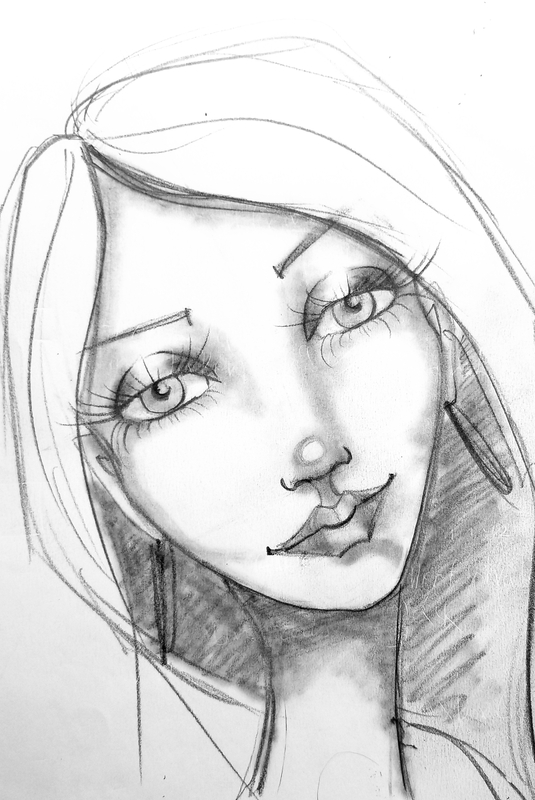 How to easily draw and paint a gorgeous face which appears to have depth and volume. My tried and true secret face shading and blending techniques that don't require using paint at all!!! To creatively and beautifully incorporate collage elements into your projects. How to create texture which enhances your artwork instead of detracting from it. My favorite techniques for making fun, colorful, easy, quick and completely stunning backgrounds! How to successfully incorporate your foreground image into your background using color, texture and the right tools. Tips and tricks to easily make your foreground images pop off the canvas! Where to add shading and highlights on your faces for maximum drama and ultimate FUN! All video lessons and supporting PDFs are fully downloadable so you can store them on any device and watch them at your leisure. On a plane, on a trane, with or without wi-fi. All lessons are released instantly when you enroll. Because the content isn't "dripped" to you like some other online courses, you can dive in any to any project, at any point, at any time! You get lifetime access to all projects so you can start them today, next week, or three years from now! So there's no time pressure to get 'em done. Start them when you're ready and not according to someone else's timeline. I've provide photo-clickable-links for all the products and supplies I use in every single project so all you have to do is simply click to get what you need, when you need it! Content stays private to this course. Other course instructors release their paid content over time on YouTube or for drastically reduced prices later. How is it fair that you have to pay more just because you jumped early while others get the same content for reduced or free? Umm... it's not. You're payment gets you exclusive access to these tutorials and these will never be released to the general public. Ever. 30 Day Money Back Guarantee if you're not happy with the course, for any reason, no questions asked. Access to a warm and wonderful Facebook Community! Private in-school support where you can ask questions, post pictures and request feedback (or if you'd simply like to leave a comment!). Long story short: you get instant and forever access to the content so you can pick and choose the projects that fit your budget, your timeframe, your ability, and your style! Come join in the fun!!! Which project are YOU going to do first? How to mash all your favorite supplies together in one mega project and have a blast PLUS Intro to Art Journaling! An Online Course which includes 10 Step-by-Step Mixed Media Projects which directly accompany my new book, Mixed Media Magic! Make this easy and fun Mixed Media Llama with me! The course starts now and never ends! It is a completely self-paced online course - you decide when you start and when you finish. You have forever and instant access to all the lessons once you buy into a course. What if I have a question? Who do I ask?